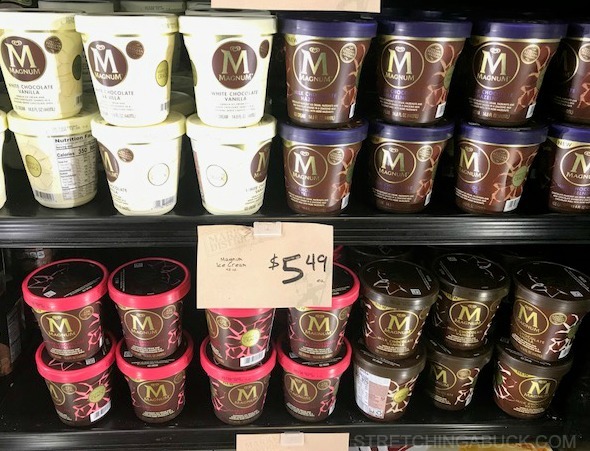 FREE Samples of NEW Magnum Pints at Giant Eagle! Disclosure: Sponsored post by Mirum. All opinions are my own. View my disclosure policy for more info. Valentine’s Day is right around the corner, and nothing says LOVE like chocolate. Right?! If you disagree, I’m not sure that we can be friends! 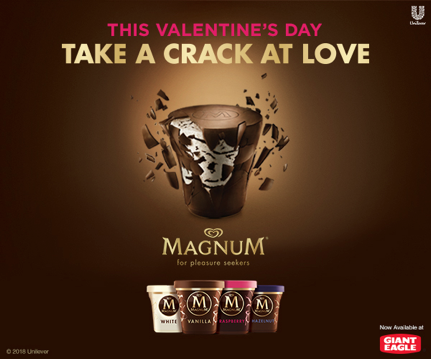 ;-) Personally, I love chocolate every day of the year…and great quality chocolate paired with ice cream is just about as good as it gets! I was pretty excited to learn that Magnum (makers of those delicious ice cream bars) are now offering NEW Magnum Pints! These aren’t just any old pints of ice cream though. 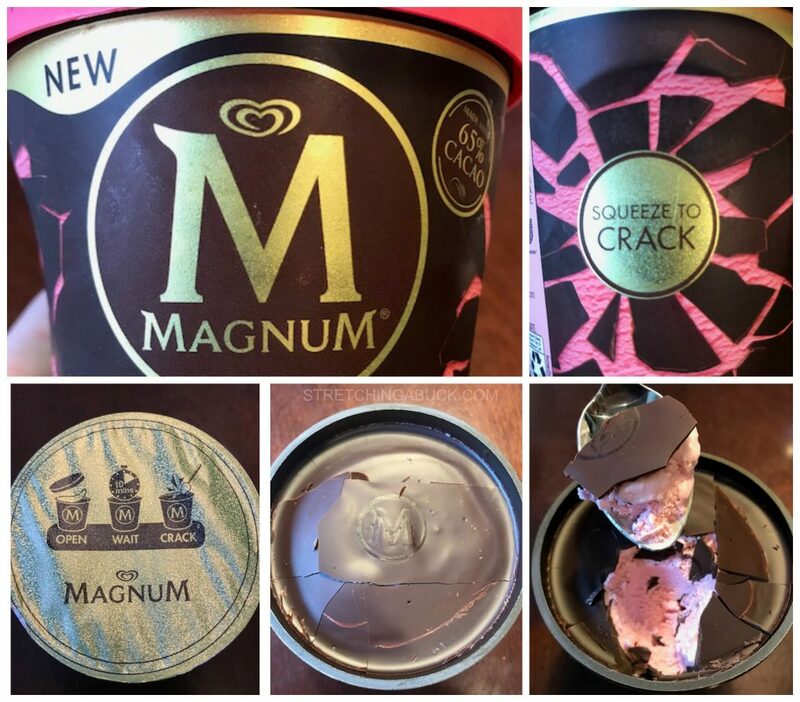 Magnum pints are topped with a unique Magnum chocolate stamp that you “crack” by squeezing the sides of the ice cream container or by using your spoon. We recently stopped by our local Giant Eagle store and bought a pint of Milk Chocolate Vanilla and Dark Chocolate Raspberry to try. It’s impossible for me to pick a favorite. Both flavors were bold and decadent…and perfect for sharing (or not!). In addition to the thick layer of chocolate on top, you’ll find dreamy layers of chocolate throughout your pint of ice cream. This ice cream didn’t just taste great…it was also pretty fun to eat. Milk Chocolate Vanilla – silky vanilla ice cream, with thick milk chocolate shards, all surrounded by a cracking layer of milk chocolate. Dark Chocolate Raspberry – raspberry ice cream with thick dark chocolate shards, all surrounded by a cracking layer of dark chocolate. Topped with a unique Magnum chocolate stamp. Made with Belgian chocolate. Milk Chocolate Hazelnut – chocolate hazelnut ice cream with hazelnuts and milk chocolate shards, all surrounding by a layer of milk chocolate. Topped with a unique Magnum chocolate stamp. Made with Belgian chocolate. White Chocolate Vanilla – silky vanilla ice cream, with thick white chocolate shards, all surrounded by a cracking layer of white chocolate. Topped with a unique Magnum chocolate stamp. Made with Belgian chocolate. Guess what’s awesome?! 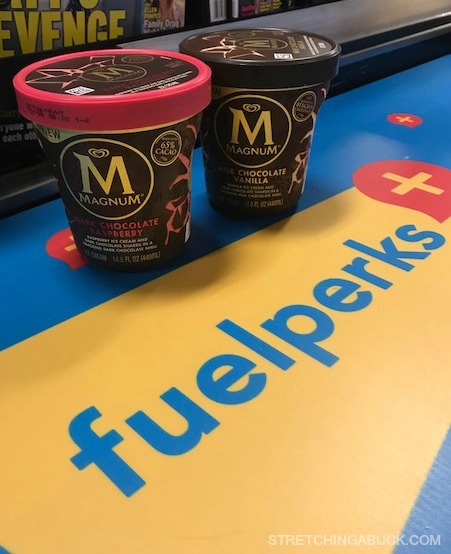 If you live near a Giant Eagle store, you can stop by on 2/10/18 and 2/11/18 to sample Magnum Pints Milk Chocolate Vanilla for FREE! Find a Giant Eagle store near you HERE! What flavor of Magnum Pints are YOU most excited to try? !